The Gray Report: The Yankees are Bordeaux, the Giants are...? I made a mistake last weekend while teasing Eric Asimov on Twitter about his unsophisticated taste in baseball teams. My mistake was not in razzing a guy with such an erudite palate for supporting the Goldman Sachs of baseball; it was in my analogy. I said "Yankees= Screaming Eagle." But I was wrong, and I apologize to Screaming Eagle. The Yankees are first-growth Bordeaux: entitled gentry with an expectation to be among the best every year -- which they usually are. Sparing no expense, they're priced out of the average person's budget, but they just don't care; they have more than enough wealthy fans willing to prostrate at their feet. They like it when countercultural types disdain them; they prefer the world separated by class. (If they do deign to hire an unruly servant -- a Giambi, for example -- that ruffian must clean up and respect his masters.) They're timeless, age-worthy, formidable and admirable in a cold-blooded capitalist way. The Rangers, on the other hand, are edgy, fast, with a dark side barely suppressed. They've underperformed for their entire history and they're wildly unpredictable now, with the potential for greatness or to completely unravel. They're a combination of bumpkins, rebels, military types and dopers. They are cool-climate, wild-yeast Syrah from a foggy part of Mendocino County. The Phillies are respectable, predictable and solidly built, strong in every facet, giving a good performance every year. If they have a weakness, it is susceptibility to aging. But they have rabid fans who will not desert them even if the rest of the country is against them, and they continue to rack up decent scores. They are Napa Valley Merlot. 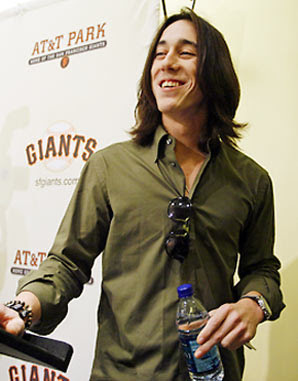 So what wine are the coolest baseball team on the planet this year -- the San Francisco Giants? Until last night, every one of their games in postseason, as well as the preceding week, had been a tense, well-played, low-scoring classic. They are the connoisseur's team. A middle American might want more power; a conservative might complain that they're not completely dry. They're on the knife edge of ripe enough, torturously so. They are obviously a product of their terroir. From the deadpan announcers to the senior-citizen "ball girls," this is a team that just screams "San Francisco." The Giants are Riesling. It's tempting to declare them to be Champagne, but The Gray Market Report is a highly respectable wine blog, and in the wake of two celebrations and counting, I will not encourage or condone cannibalism. Sometimes a man has to take a stand. Riesling it is. And tomorrow's another vintage. I like the Bordeaux comparison as a fan of the Yankees and Bordeaux. Makes sense on many levels except price. Agreed, Yanks are the most expensive team. You can't even go watch one of their lower paid players (like drinking a fifth growth in a great vintage at reasonable market rates) without the full price of admission to Yankee stadium driven by Arod and CC salaries. But, unlike in Baseball where the Yanks will be the highest priced team, not so with Bordeaux. There are lots of great Bordeaux, if you stay away from 1st and 2nd growths and Parkerized 95+ point releases,. that are more of a bargain than many California Cab, Aussie Shiraz, Burgundy, Rhones, etc. So a fun analogy for sure, but not completely consistent. Maybe you meant to compare the Yanks to first growth Bordeaux Now, lets go Yanks!!! Alsatian, German, Australian, Californian, or Washington state? I find that the SF Giants have more in common with California (definitely not Burgundy) pinot noir. They are recently trendy, with many bandwagon fans. Previous vintages had some big stars, but little consistent success and no championships. The team, like the grape, is accustomed to cool breezes at night. The quality is extremely variable from year to year and temperamental. While mainly lightweight and characterized by finesse, at times can be over-the-top, too hot, and quirky. Can be enjoyed young, with good aging potential. Oh, and both go well with Cha-Cha bowls. That's my case for California pinot noir. Adam: I guess "The Yankees are first-growth Bordeaux" in my first sentence was a little too vague. Sorry about that. Guren: It's a very strong case. The Giants might be California Pinot Noir -- the expensive ones aren't always better than the affordable ones, and they were able to relabel some serviceable ones they found on the bulk market. They're also just a little more frustrating than Riesling, with an equally great reward when they're good. And Pinot Noir does much better in California than Riesling. I leave it to other readers: Giants = Riesling, or California Pinot Noir? I cannot argue the hipness quotient of the Giants, but as a Yankees fan for more than 40 years I must take issue with the Bordeaux comparison. First of all consistency has only come in the last 15 years, the Jeter era. Before that the Yanks oscillated wildly with Steinbrenner mood swings. If anything the Yanks are vintage Champagne, post-global warming, or Burgundy, oozing class always and finally having found consistency despite the vicissitudes of vintage. Eric: I see your vintage Champagne comparison; how could I not? But I think it's a stretch to see the Yankees as Burgundy. They haven't been an estate bottling since the beginning of the free-agency era. Besides, they've always been more about power than finesse. And you might see vintage variation in the Yankees, but the rest of us don't. Blake, I'm with you on the Yankees/Bordeaux comparison. Long history of success, to be respected whether you like them or not. Yankee fan Eric misses the forest for the trees, as you point out.The Yankees as an entity are the aristocracy of baseball, standard bearers called upon to live up to the highest of expectations. The Giants, however, to me, seem neither Riesling nor Pinot Noir or, for that matter, Champagne. The specifics of each comparison are valid, but the overall character doesn't match. Could Riesling be The Freak, or dye its facial hair? I think not. Perhaps Pinot Noir could do these things, but it would be ill-advised. I, for one, would not like to see it. The Giants need something scruffier, more boyish, ragtag. Something capable of greatness but not usually expected to achieve it. Often a component of something greater than the sum of its parts. I never thought I would be able to write this, but the SF Giants are... the 2010 World Series champions. Congratulations to the team, the city and the long-suffering fans. What an amazing year for a team that did not qualify for the playoffs until the last game of the regular season.